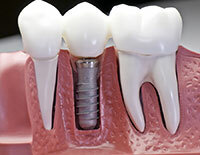 Dental implants are synthetic structures that are placed in the area of the tooth normally occupied by the root. Dental implants are anchored to the jawbone or metal framework on the bone and act as a foundation for an artificial tooth or permanent bridge. In some cases, dental implants can be used to attach dentures. Dental implants are so well designed that they mimic the look and feel of natural teeth. Dental implants are usually made of a synthetic yet biocompatible material like metal or ceramic. What is the dental implants procedure like? For more information on Dental Implants in the Yakima, WA area call Reep Family Dental at (509) 248-0986 today!